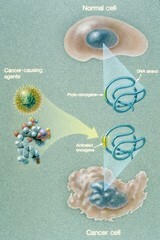 This illustration explains how a normal cell becomes a cancer cell. An oncogene in a normal cell appears to regulate and influence cell growth and division. When a cancer causing agent affects a cell's DNA and the oncogene is activated, a cancer cell develops.